He was president of the Church - better known as the Mormons - for 13 years. membership expand to 13 million people. Massachusetts Governor Mitt Romney, runs for US president. Based in Utah, half of the LDS membership is now drawn from outside the United States. Council of the Twelve Apostles, which is likely to wait until after his funeral. The current most long-serving apostle is Thomas Monson, aged 80, The Associated Press reports. Hinckley died of complications arising from old age, Church spokesman Mike Otterson said. Orrin Hatch of Utah, a fellow Mormon. people of all faiths throughout the world." 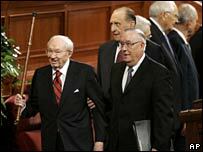 Hinckley was ordained as the 15th president of the LDS in March 1995. He travelled the world extensively, dedicating LDS temples. In April 2006, he told a Church conference he was "totally in the hands of the Lord".